Derek Taylor's iconic memoir is a rare opportunity to be immersed in one of the most whirlwind music sensations in history: Beatlemania. As Time Goes By tells the remarkable story of Taylor's trajectory from humble provincial journalist to loved confidant right at the center of the Beatles's magic circle. Contains mature themes. Derek Taylor's iconic memoir is a rare opportunity to be immersed in one of the most whirlwind music sensations in history: Beatlemania. As Time Goes By tells the remarkable story of Taylor's trajectory from humble provincial journalist to loved confidant right at the center of the Beatles's magic circle. 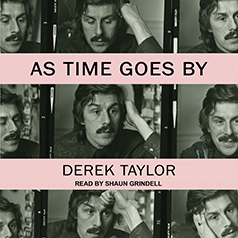 In charming, conversational prose, Taylor shares anecdotes and reminiscences so vivid and immediate that you find yourself plunged into the beating heart of 1960's counterculture. Whether watching the debut performance of "Hey Jude" in a country pub or hearing first-hand gossip about a star–studded cast of characters, Taylor's unique narrative voice forges an autobiography like no other. Reissued here in a brand new edition with a foreword by celebrated writer Jon Savage, this long–admired memoir is a cult classic of the genre.